Thecus is the first dual-bay NAS box manufacturer we’ve seen to ditch the usual ARM or Marvell processors found in mainstream models in favour of a fully fledged 1.8GHz Intel Atom D525 CPU. 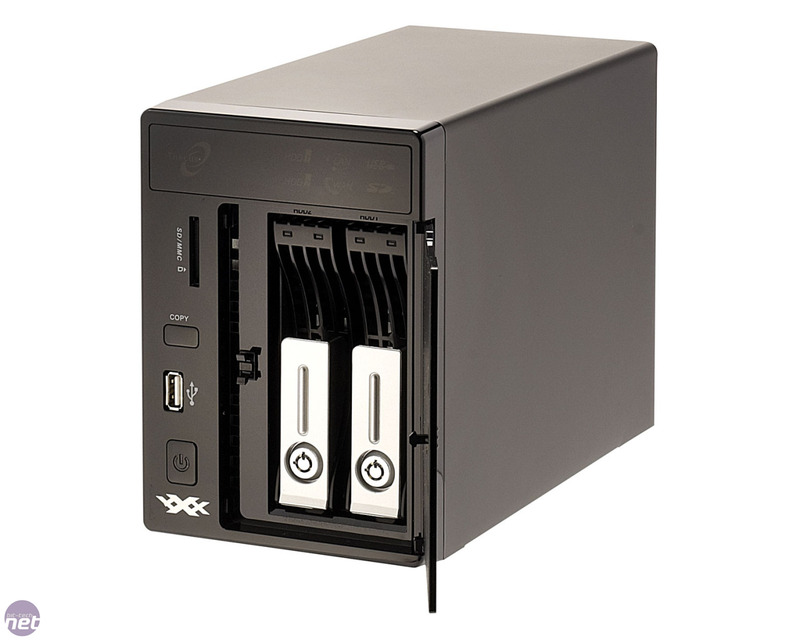 This comes at a price – the N2200XXX retails for a hefty £308 – but it should provide significant grunt when dealing with file transfers, as well as lots of concurrent tasks such as downloads and media streaming. 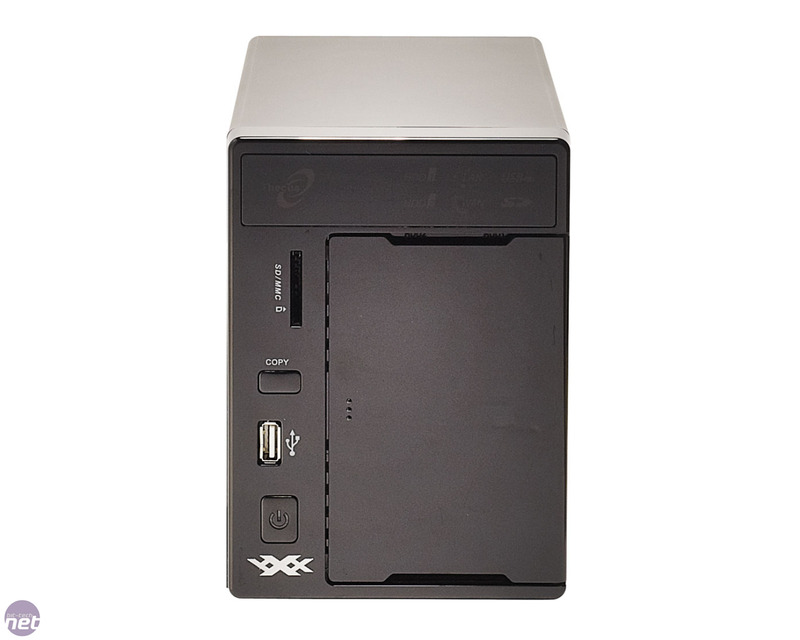 It also plays host to a whopping 1GB of DDR3 memory – twice that of the Synology DiskStation DS211+. Two Gigabit Ethernet ports are also fitted, making it extremely flexible when it comes to sharing data across multiple networks or daisy chaining more than one NAS box together. 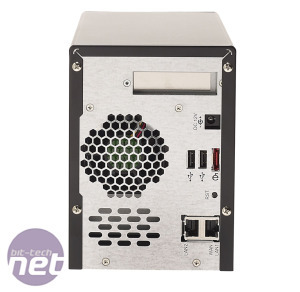 As you’d expect from a modern NAS box, the front fascia is equipped with a USB 2 port along with an SD card reader, while the rear panel has a further two USB 2 ports and an eSATA port. Meanwhile, up to two 3TB hard disks can be installed using two lockable hot-swap bays. 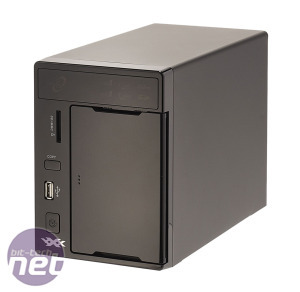 Most bases are covered, then, although we’d still like to see USB 3 incorporated into NAS boxes at this price. good half hour between us powering it on and beginning to transfer files, mainly due to a lengthy format of our hard disk. The operating system is slick and uncomplicated, although we found it quite laggy. 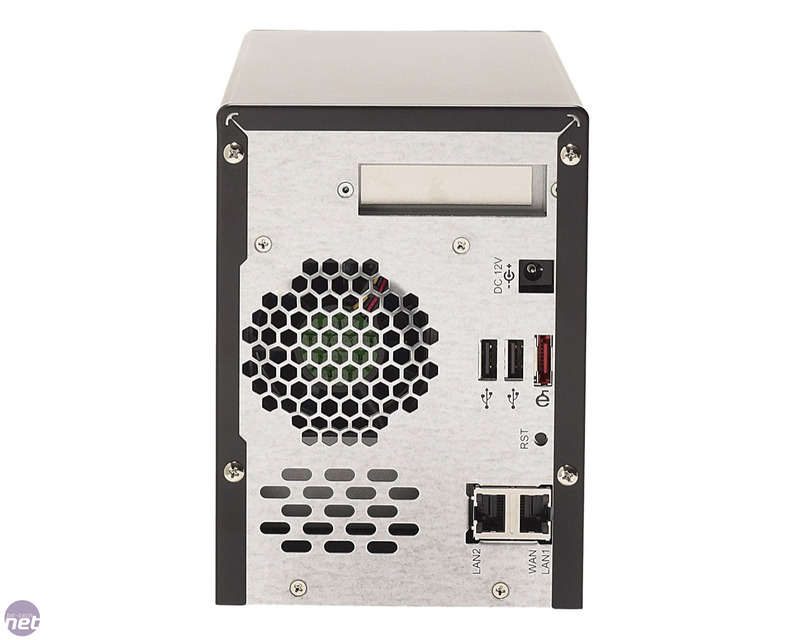 Default features are sparse, as Thecus offers free add-on modules for the N2200XXX. These include BitTorrent clients, mail servers and backup programs – essentially, many of the features included with other NAS boxes as standard, although this gives you the option of keeping things tidy. Thankfully, FTP, iTunes and media servers are installed, as well as backup software, iSCSI support and the very handy ability to mount ISO image files. In our file transfer tests, the N2200XXX managed to be both spectacular and disappointing. Read and write speeds in our large file test were close to 100MB/sec – the fastest we’ve ever seen, and probably limited by the SATA 3Gbps Samsung Spinpoint F3 1TB HDD we used. However, the N2200XXX struggled with our small file test, managing a read speed of only 16.3MB/sec and a write speed of 24.5MB.sec. This is still enough to saturate most powerline network adaptors or 100MB/sec networks, but will be a bottleneck over Gigabit Ethernet. The DS211+, on the other hand, didn’t manage quite such spectacular results in our large file test, but recorded much healthier results in the small file test – a read speed of 46.3MB/sec and a write speed of 36.9Mb/sec. 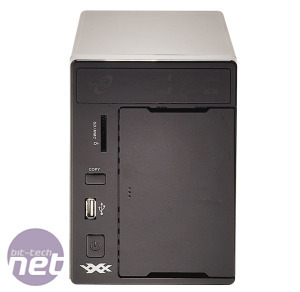 The N2200XXX also proved quite noisy, and its 60mm fan didn’t cool our hard disk particularly well. For storing large files, such as HD movies, the N2200XXX is a monster. However, in most other situations, especially when dealing with large numbers of small files such as MP3s or photos, the grunt of its Atom CPU and 1GB of DDR3 memory haven’t paid off. This is odd considering the N2200XXX’s impressive hardware, so clearly Synology’s DS211+ uses some operating system tricks to produce its excellent performance. 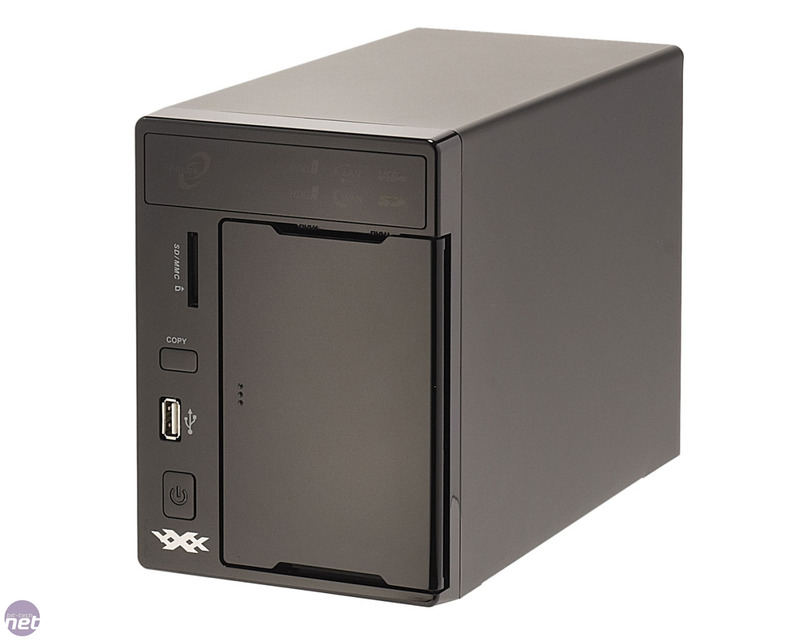 With the N2200XXX failing to justify its higher price, the quieter and easier to use DS211+ remains our NAS of choice. Head over to the results page to see the scores.